Ayrton Senna was the pride of Brazil during his too-brief career as one of the greatest Formula One drivers history, winning the world title three times, including two showdowns with his arch-nemesis, Alain Prost. In the new documentary "Senna," from director Asif Kapadia, we watch the Brazilian rise from the ranks of teen go-kart racer to world champ. Kapadia does a nice job of crafting the narrative pitting the young upstart, Senna, against the established champ, Prost, a man with friends in all the right places. The two started out as opponents, then found themselves on the same team, a perilous situation that allowed their contempt for each other to really blossom, before again racing for different teams, allowing them to again be very open about the enmity between them. Chief among Prost's complaints about his rival was Senna's enduring faith in God, one that the Frenchman claimed inspired him to take outsized risks that endanger not just hos own life but those of other drivers. As with many bodies governing international sport, the world of Formula One is fraught with intrigue and nationalistic nepotism—pity the fool going up against a guy from the same country as the president of the federation, in this case, France’s Jean-Marie Balestre, an arrogant man prone to barking things like, "The best decision is my decision!" Both Prost and Balestre play the part of villains magnificently, with petty comments, cheap shots and eyebrow-raising rulings that thwart Senna at every turn, inspiring him to declare at one pint, "I was f***ed many times by the system." As is often the case with a documentary, especially ones that focus on sports figures, the less you know about the subject the better, but one frustrating aspect of the film is that it assumes a level of knowledge about the sport that--excuse the classism/snobbery--your average documentary viewer simply doesn’t possess. In two races shown in the film, a world title is decide by an incident involving a “chicane,” but no one can be bothered to explain what hell a chicane is. And neither moment is shown slowly enough and/or often enough for an outsider to make any judgments about it. The film's other glaring weakness is that it neglects to explain, even in passing, the reconciliation that took place between Senna and Prost. In fact, the film doesn’t even acknowledge it, the two men simply go from enemies to intimates in the blink of an eye. 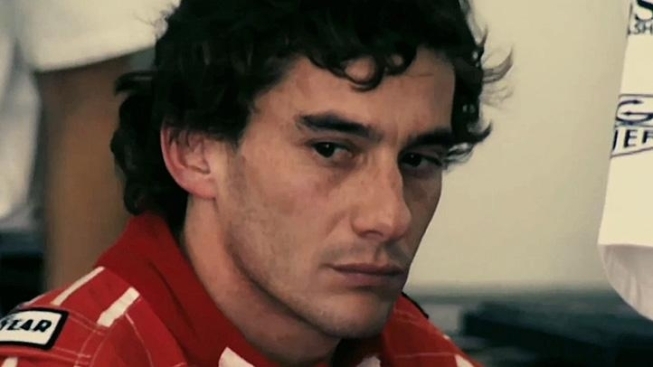 Failings aside, Senna" is a fascinating story about an outsider's fight against the system and the power and peril of a man's faith.